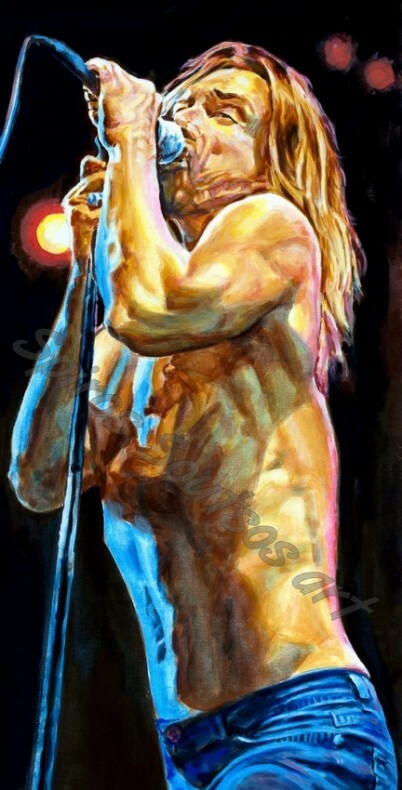 James Newell Osterberg, Jr., better known by the stage name Iggy Pop was born on 21 April 1947. He is an American singer-songwriter, musician and actor. He is the vocalist of influential proto-punk band The Stooges, who has been known for his outrageous and unpredictable stage antics. The Stooges’ first album The Stooges, (on which Pop was credited as “Iggy Stooge”), was produced by John Cale in New York in 1969. Both it and the follow-up, Fun House produced by Don Gallucci in Los Angeles in 1970, sold poorly. Though the release of Fun House did not receive the recognition it expected, it was later ranked #191 in Rolling Stone’s ‘500 Greatest Albums of All Time’ in 2003. Shortly after the new members joined, the group disbanded because of Pop’s worsening heroin addiction. Pop’s career received a boost from his relationship with David Bowie when Bowie decided in 1972 to produce an album with Pop in England. With James Williamson signed on as guitarist, the search began for a rhythm section. However, since neither Pop nor Williamson were satisfied with any players in England, they decided to re-unite The Stooges. Ron Asheton grudgingly moved from guitar to bass. The recording sessions produced the rock landmark Raw Power. After its release Scott Thurston was added to the band on keyboards/electric piano and Bowie continued his support, but Pop’s drug problem persisted. The Stooges’ last show in 1974 ended in a fight between the band and a group of bikers. Iggy Pop’s music has encompassed a number of styles over the course of his career, including garage rock, hard rock, new wave, jazz, art rock and blues. Though his popularity has fluctuated through the years, many of Pop’s songs have become well-known, including “Lust for Life”, “The Passenger”, “Real Wild Child”, “Candy” (a duet with Kate Pierson of The B-52’s), “China Girl”, “Nightclubbing”, “Search and Destroy” and “I Wanna Be Your Dog”.